Ivanka Trump is right. American people want to work for what they get, but they also want a level playing field and the opportunity to get ahead if they work hard. That’s not the current schema of the American worker and that’s not how Ivanka built her business. Ivanka Trump gives an interview. At my last full-time office job, our shipping department, the very crux of the whole business model was run by a full-time worker. The problem is, in order to be financially independent enough to live away from home, she had to work two full-time jobs. We knew approximately when she would be able to come into the office and she worked hard every single day, but she wasn’t available during our normal hours of operation, which put stress on our whole team when we weren’t able to quickly answer customer’s questions about when something shipped. We had back-up in the form of our Sales Manager, but he was also the one person on the sales floor, routinely answering other questions. It’s not just in not being able to answer customer calls first thing in the morning with shipping information. Because she worked two full-time jobs, she didn’t begin her production could be slower during the day, leading to a frenzy of activity when the UPS and Fed-Ex delivery trucks arrived during the day. She often complained of being tired and she rarely had a complete day off. This happens all over the United States, even in cities with a relatively low cost of living, like Houston. While job reports are quick to state that out of over 148 million workers in America, they don’t show an accurate picture of how many people work multiple jobs, especially in a gig economy. As Erik Sherman points out in his Forbes piece, there’s a problem with the underlying collection of survey data that people working multiple jobs are harder to reach to complete a survey, thereby being underrepresented in the sample of the overall picture of the US jobs number. Additional problems with this survey method, as Sherman mentions is that the Bureau of Labor Statistics is dependent upon people both believing they have a second job and also being willing to report that they have a second job, which may be especially true if they have a distrust of the government finding out about their second job. Multiple jobs aren’t the only problem weighing down the American worker — it’s lack of sleep. In 1942, the average American slept just under eight hours a night, clocking in 7.9 hours of sleep on average. Compare that to the last Gallup report on sleep, where American’s are getting an hour less sleep on average, with the majority of Americans getting less than 8 hours of sleep, and there’s a problem with both being well-rested and greater overall well-being in this country. It’s not just multiple jobs keeping the average American from sleeping. Anxiety over money, potential health issues that are pushed aside without being follow up with due to a lack of quality insurance, and increased dopamine levels that soothe us as we surf social media sites that keep us awake after long days also contribute to poor sleep quality. This is how our current workforce sociology gets it wrong. How do we get it right — and how does that impact business? According to studies by leading economists, increasing the current minimum wage improves worker morale, cuts down on absenteeism, and increases productivity, while simultaneously boosting the economy. Which is great, if you’re talking about economic theory. What about in practice — and what happens when it’s not just the minimum wage that increases, but workers are paid a living wage? Representative Ocasio-Cortez’s tweet announcing that she makes sure no one on her staff earns less than a living wage in Washington, D.C. was not the first time she made waves for her employment policies. Before she even took the oath of office, Ocasio-Cortez announced that she would pay her interns $15 an hour, enabling college students from more diverse backgrounds would be able to get real-time experience and training that had been out of reach of those that weren’t from the wealthy echelon. No matter what side of the political spectrum you fall under, you have to admit that Representative Ocasio-Cortez is an impressive figure. Ocasio-Cortez waits to question Michael Cohen. In less than a year, she has become remarkably effective at getting her message out, for drawing attention to her causes, and whether you believe it’s for good or bad, pulling the Democratic Party to the left. She doesn’t just rival the wattage power of pre-Presidential Barack Obama, she surpasses it. 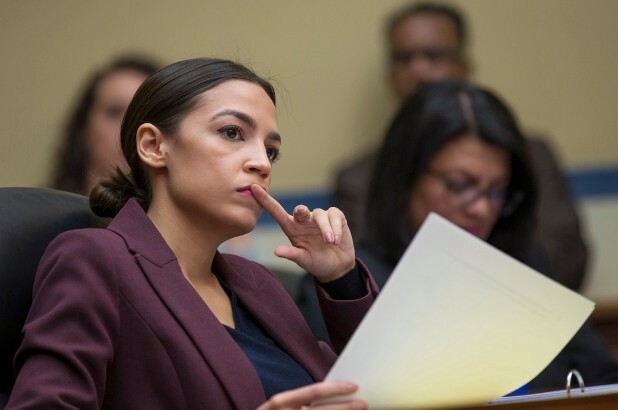 What we don’t consider is, in that same hearing, most of Representative Ocasio-Cortez’s colleagues drew criticisms for being unprepared — for asking the same, tired questions. While you could argue that the House Oversight Committee received Cohen’s testimony later than they should have under their guidelines, she proved that it was possible to still be prepared, ask tough questions that further the investigation, while still juggling the same, if not more responsibilities. Representative Ocasio-Cortez is an impressive person, to be sure, and she is young, but even she can’t do it all. She relies on her team to research, to be just as effective as she is at their jobs. She relies on a team not encumbered with juggling multiple schedules for different jobs, sleep-deprived over money anxiety. Because she offers a living wage, Ocasio-Cortez has an incredibly talented team that gets to marry the two things that matter most to people in the workforce when it comes to job satisfaction: they are valued and they feel their work matters. Her team can prepare the boss and go over strategy at a moment’s notice because they work one job that pays them well for the work they do. This is not to distract from Ocasio-Cortez’s incredible talent, but it adds to it. In our world where social media drives clips to viral status within an hour of a committee meeting, she has harnessed her power and a team that not only gets incredible results but gets to show her constituents and potential future constituents a productive end result. As people continue to try to tear her down, Representative Ocasio-Cortez continues to impress and be impressive because she understands the value of people. CEOs could do well to learn by her example. Highly Sensitive Person (HSP) with strong opinions with a kind heart. Combined with excellent writing, these are my super powers. Where smart, sassy, and liberal isn’t just a tagline.